PUMA Energy Malawi Limited is an associate company of PUMA Energy which is a subsidiary of Trafigura Beheer B.V. - one of the world’s largest independent commodity traders. It is owned by a local conglomerate, Press Corporation PLC and PUMA Energy on a 50-50 basis. PUMA Energy was formed in 1997 in Central America to develop a comprehensive network of oil storage and distribution facilities. Puma Energy has since expanded its activities worldwide achieving rapid growth, diversification and product line development to become one of the largest independent global downstream companies. Puma Energy is currently located in over 26 countries worldwide, and employs more than 1,800 people. Puma Energy’s activities in the midstream sector include the supply, storage and transportation of petroleum products. The company’s day-to-day activities and growth are underpinned by extensive investment in infrastructure which in turn optimises supply chain systems and captures value for Puma Energy as both asset owner and marketer of product. Puma Energy’s downstream activities include the distribution, retail and wholesale of a full range of refined products. The company has a global network of over 500 retail service stations and a wide range of strong product offerings and services. PUMA Energy Malawi has a reputation of trust and commitment to all of our customers and have vast experience and understanding of the Malawi market. The company is involved in supplying petroleum products to a wide spectrum of business sectors including Industry, Transport, Construction, Agriculture and Mining. We operate a network of 52 retail sites across the country, a fuels and lubricants depot in each of the three regions and our own fleet of bulk delivery vehicles. Our Head Office is located in Blantyre and regional offices in Lilongwe and Mzuzu. We are therefore positioned as a competitive national marketer of both fuels and lubricants. PUMA Energy Malawi is indisputably an industry leader in health and safety practices and in environmental standards. We believe that good Health, Safety and Environmental performance is an integral part of efficient and profitable business management. Having own laboratory in the country by which the company is managing to add value to its customers. Successfully managing to supply huge expansion programmes for various companies such as JTI Tobacco Company and Carlsberg Malawi through planned deliveries, daily demand forecasts and effective communication between Puma Energy Malawi and the customer. Puma Energy Malawi has been a strategic partner in the development of the Kayelekera Uranium mining Project in Karonga with Paladin Africa and is the current supplier of the mine. 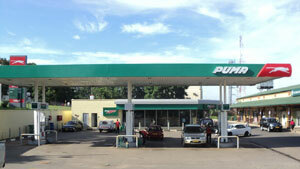 Puma Energy Malawi is committed to providing total customer satisfaction. The focus of this commitment is our “front line” people who are dedicated and competent in responding to customer needs so that every contact with Puma Energy Malawi is a positive one. Our teams of Sales Managers, Technical Personnel, Drivers, Engineers, accounts administration and marketing support staff have been chosen for their dedication and professional expertise. They are also part of the innovative and creative approach Puma Energy Malawi takes to improve the way we do business to benefit our customers. The skills of our people are promoted in the development of new products and systems encompassing the latest technology, from the simple to the complex.